Even with the weather getting better and the first signs of spring around, the challenge Gary Sutherland set himself in Walk This Way brings out the blisters in me. Trekking 240 miles along three of Scotland’s iconic walks is quite a challenge. No rest breaks, walking 20 miles a day, on his own…does not immediately sound like a recipe for fun. 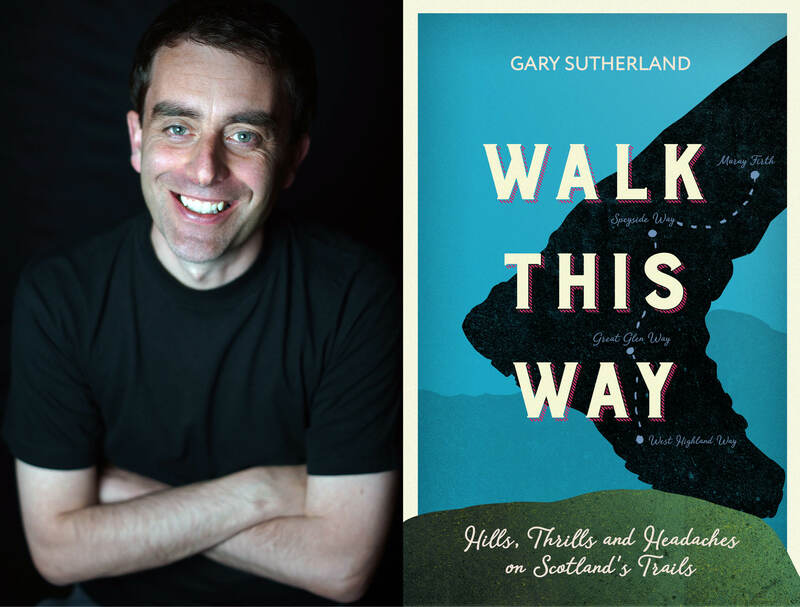 Nevertheless, Gary’s travelogue Walk This Way is an amusing and light-hearted account of the landscapes he sees and people he meets with little made of his weary, sore feet. Gary – thanks for taking time to catch up with Westender Magazine – the first question has to be why?! Why do these three walks in a row? I never viewed walking as an activity I’d enjoy. I love cycling and running and living in Glasgow I’ve seen ‘The Walkers’ with their colossal backpacks getting ready to tackle the West Highland Way. I always thought it wasn’t for me. Having spent years living on the doorstep of Scotland’s most famous long-distance trail and doing a good job of ignoring it, I finally decided I needed a new challenge and wanted to test myself at something that was completely alien to me. The highlights of my trek were crossing Rannoch Moor, climbing the Devil’s Staircase near Glencoe, walking towards Ben Nevis on the final day of the West Highland Way. The standout moment of the Great Glen Way was reaching Loch Ness. I couldn’t believe I’d got there on foot from the edge of Glasgow! Wandering through Malt Whisky Country on the Speyside Way was both a blessing and a danger. Beautiful scenery but a fair number of distilleries and some inviting pubs. Reaching the shore of the Moray Firth on the final day of my 240-mile march across Scotland was the absolute highlight. I felt a mixture of elation, exhaustion and relief. Did you have a favourite walk? My favourite of the three was without doubt the West Highland Way. It’s world famous for a reason. The epic mountain scenery, the wild moors, plus there’s a lot of camaraderie among the walkers on what has become a well-trodden path. But not one that’s overly busy, at least not in springtime when I set off on my solo journey. How would you compare and contrast the three walks? The West Highland Way was the most visually stunning of the three walks but also the most difficult. I found the Loch Lomond section, along the boulder-strewn wooded shore, far more awkward than I had anticipated. There’s also a steep climb out of Kinlochleven towards the end that fairly tests the legs. A good deal of the Great Glen Way is on the towpath of the Caledonian Canal, which was easier on the feet. You could cycle much of the Great Glen Way – and people do. The Speyside Way is the shortest of the three walks (66 miles, compared to 75 for the Great Glen Way and 96 for the West Highland Way) and the terrain is easier. It’s mostly forest walks, old railway lines and wandering across farmland with occasional glimpses of the River Spey. But passing through lovely villages like Aberlour and later reaching the sea makes it worth it. You were brought up in Hopeman but you now live in Glasgow. Did the final walk – the Speyside Way – feel like a long walk home? Trekking through Speyside did feel like a homecoming and that was the intention, the ultimate reward for my efforts. When I reached Grantown-on-Spey, I knew I was nearing the end of my long journey. From the slopes of Ben Aigan, above Fochabers, I saw the Moray Firth and that gave me a much-needed shot of adrenalin for the closing miles. My family – including my granny, my mam, my wife and kids – were there to greet me at Spey Bay, where the river flows into the sea, and that was a very special moment. What was the biggest concern for you setting out on the journey? I guess the distance involved was the main thing. In total, the walk was almost 240 miles and I was determined to hike the three long-distance trails consecutively over 12 days, with no rest days. So that’s 20 miles per day. I felt fit (through my regular cycling and running) and I packed light, just a small backpack. I had booked a combination of B&Bs and hostels. No way was I carting along a tent! A big concern was getting blisters. No matter how fit I was, blisters could be a source of real pain. But I received some great advice in an outdoors shop in Glasgow, where I bought good walking shoes and proper walking socks – indeed a ‘sock system’ of thin liner socks beneath thicker woollen socks – and would you believe it, I didn’t suffer a single blister during the entire trip! You say you are not a keen walker – what were you scared of? My two main fears were heights and the prospect of extended periods of isolation. I had a wobble on Conic Hill on my first day, looking down on Loch Lomond. It’s not even that high a hill, but I do suffer from vertigo. I later froze half-way up the Devil’s Staircase, gazing back at Glencoe. My legs completely locked. Luckily, I had company and a fellow walker talked me over the Devil’s Staircase. In terms of isolation, I was worried in advance about perhaps having to cross Rannoch Moor on my own. Which is how it turned out… in torrential rain and high winds. Halfway across the moor, I decided to make a run for it. Legging it across the moor – this bleak, inhospitable place – I burst out laughing at the ridiculousness and exhilaration of it all. I do think the biggest challenge of all – more than the distance – was deciding to do this cross-country trek on my own. I’m a bit of a scaredy-cat and did struggle with extended periods in dark forests. I have a vivid imagination! I kept seeing things through the trees. Imagination is great for a writer, but not so much when you’re trekking in the middle of nowhere, miles from civilisation and haven’t talked to anyone all day. The Great Glen Way and Speyside Way were considerably quieter than the West Highland Way. What were the walkers you did meet like? There’s a real spirit of camaraderie on the West Highland Way. Even if you’re walking on your own, you’ll bump into people during the day or swap stories with fellow walkers over a pint in the evening. Near Bridge of Orchy, I met a bloke from Glasgow who was moving gingerly on account of two really bad blisters. I really sympathised with him but he turned out to be a machine – he just kept going. We met up in Fort William at the end of the West Highland Way and toasted our achievement with a dram. There was a real international cast on the West Highland Way, which shows how famous the trail is. I bumped into Americans, Germans, Zimbabweans and an unfeasible number of Belgians. The Belgians are mad for the West Highland Way. Who knew?! This is not the first travelogue you have written – you cycled round Scotland with your brother – what do you enjoy about this genre of writing? The beauty of travelogues is that they combine body and mind. You do the challenge, the journey – whether it be cycling around Scotland, walking across Scotland, golfing Scotland’s islands, all of which I’ve done – and gain a real sense of achievement. Then you sit down and tackle the next mountain – of writing a book. I’ve seen a great deal of Scotland now through my book adventures and met lots of fascinating characters. I never tire of the country I call home. There’s so much to see and experience. You are a supporter of libraries and a frequent visitor to the libraries in the West End, why? Most of my writing is done at home but sometimes I’ll venture out for a change of scene, often to the Mitchell Library and sometimes Hillhead Library. I love libraries and as well as finding them to be good places to write, I also make a point of taking books out on loan so that I’m supporting libraries. They’re special places and should be cherished. You have a background as a sports journalist and also taught English abroad, but you have always been drawn to settle around the West End of Glasgow, why? I grew up in the fishing village of Hopeman on the Moray coast, went to the University of Aberdeen where I gained an English Literature degree, then moved to Glasgow. My first flat was in Kelvinbridge. I now live in Bearsden with my family but I’m often in the West End. I enjoy cycling into the West End, along the towpath of the Forth & Clyde Canal to the locks at Maryhill, then following the River Kelvin down to Kelvinbridge. My wife and I enjoy taking the kids to Kelvingrove Park. The West End has nice coffee shops, pubs, curry houses and I also enjoy going to gigs at venues like SWG3 in Finnieston. How would you sum up this book and why should Westenders get hold of a copy? Walk This Way is a tale of courage, endurance, cataclysmic quagmires, ludicrous ledges, feral goats and a baffling number of Belgians. The book is intended to inspire and raise some smiles along the way. Westenders are only a few miles from the start point of my journey in Milngavie. I’d encourage people to experience the West Highland Way. And if you get to Fort William and aren’t completely shattered, keep going! Gary Sutherland appears at Glasgow’s Aye Write Festival on Sunday 31st March. For tickets visit ayewrite.com.